The Westin Chosun, Seoul, Monday, January 2, 2006- Dive into the Italian-style New Year's festivities and experience the delicious traditional gnocchi dish at Vecchia e Nuovo. Start off the New Year with a succulent and satisfying dish of Gnocchi. 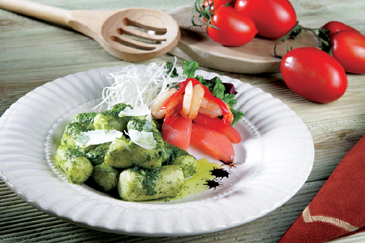 Like ttuk (Korean rice cakes), gnocchi is traditionally consumed at the beginning of the year in the hopes of bringing in good tidings and excellent health. In the rural areas of Italy, this delightful and tasty gnocchi dish is immensely popular and is featured consistently during every New Year's Day Festivals. To satisfy and delight our diverse diners, Vecchia e Nuovo successfully simulates a traditional Italian-style dining environment, and presents genuine Verona-style gnocchi. Veronese gnocchi is rich and tender, and it artfully combines and complements all the savory and hearty flavors of potatoes, eggs, cheese and fresh vegetables. Don't miss out on the chance to experience this nutritious and tasty culinary delight.